Hello and Welcome Fashion Readers! I would like to welcome you to this exciting new venture. A little virtual spotlight for my love of Fashion that I am happy to share with you. This is a very exciting time for me and a new experience. I hope you stop by as often as possible and share your thoughts and opinions on what you see and read here. Allow me to tell you a little bit about myself. It all began in a little apartment house in Brooklyn, New York. I was a little girl who spent hours either drawing, coloring or sketching. Many times playing with Barbies and paper dolls. At times I played “boutique” by raiding my mother’s closet and pretending to own a fabulous store, selling and styling to my high fashion clients. Little did I know that those games were an indication of more to come. As the years went by I always had one person at home who exemplified the meaning of style, class and ladylike chic, my mother Sabina. She was a fearless dresser and brought her great taste to all that she did. Before leaving the house the hair, makeup and attire were flawless. She had an undeniable love of shoes and of course the higher the shoe heel, the better. I learned through her so many lessons about dressing up for all occasions. She was also very crafty and had a knack for sewing. I remember the many trips to the fabric stores when she wanted a custom made dress and had her own ideas to create a design at home. This was followed by visits to seamstresses that were also her friends for years. 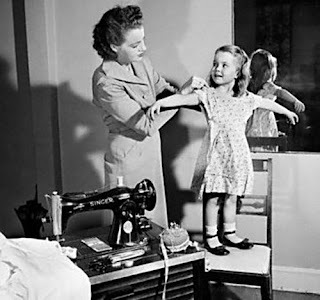 I have many memories of my mom in front of her sewing machine as she would create many pieces of clothing for us at home. By the time I was a teenager I knew “Fashion” was in my DNA and something I felt magnetized by. It was what drew my attention all the time. I sketched, draped, sewed, and even felt inspired to paint at times. I knew then that this was something that would always be dear and special for me. Today, my admiration for vintage & modern fashion continues. I’m inspired in so many ways by the art of style and design. One Style at a time!! !